It all started in the 19th century, when treaties during the Opium War forced Chinese markets open to foreign goods. Chinese customers, who didn’t have the same fascination with foreign products they do today, were unimpressed with pictures of imperial worthies and exotic colonial locations that were customarily given away as gifts of thanks by Western companies. This eventually prompted tobacco companies and drug stores to produce artistic pictures inspired by traditional Chinese art, such as Kitchen God posters – block-printed posters featuring images of the said god together an almanac. Subjects that appealed to rural inhabitants quickly gave way by urban scenery, and the almanac function transformed into one of aesthetic pleasure with discrete images of products at the bottom of the picture. Artist Wu Youru played a key role in turning the art of Nian Hua (New Year Pictures), into Calendar Posters. The first ever Calendar Poster was “Shanghai Scenery and Fortune” printed by Shanghai Hongfulai Philippine Lottery Company in 1896. It combined Chinese line drawings with Western form of perspective. Its success led to a mushrooming of Yue Fen Pai production. During the next forty years or so, the Yue Fen Pai thrived in a very nourishing environment of artistic freedom and innovation, fuelled by trade and commerce. Artists who began their careers working for pictorials and newspaper presses, set up their own studios and were snapped up by merchant companies in healthy competition with each other to find the best ways of attracting customers to their products. Chinese women, who emerged from the home into society, in the wake of anti-feudalist reforms, and the founding of schools for women, became the muses for this art form. The Calendar Poster falls in to three broad categories. Around the 1900s, Chinese society was still at the beginning of its emergence from tradition into modernity. Prints of classical paintings from the Song, Ming and Qing eras were still the go-to subject matter for domestic companies who wanted to hawk their wares. Zhou Muqiao (Dianshi Studios, Feiyingge Pictorial), one of the earliest renown creators of the Calendar Poster, pained women in traditional dress on silk canvas, as figures from classical novels. Applying richer colours, as well as form of perspectives to Chinese painting techniques, Zhou made his figures come alive by observing the postures and stances of actors at live performances of Peking Operas and Suzhou Pingtan. It was really Hangzhou artist Zheng Mantuo (Erwo Photo Studio) who created the unique art style of the Calendar Poster. The 碳粉擦笔法, Tan Fen Ca Bi Fa, now a signature of this art form, involves light lines, charcoal stumping and the application of water colours by layers, to give the skin a moist, vivid and life-like effect. The massive appeal of Zheng’s work lay in the contemporary relevance of his subject matter. He painted women in fashionable 20th century dress, and even carried out market research with the celebrities at the pleasure gardens of Shanghai. His “Autumn Water in a Silvery Pond” and “Evening Makeup” featuring a simply dressed female student, originally painted for a drugstore, enjoyed much higher popularity when circulated in print. An artist of prolific output for both Shandong and Ta Chong tobacco companies, Zheng’s success propelled the Yue Fen Pai into the commercial and industrial arena. One of the most unique talents in Calendar Poster art is Xie Zhiguang, a student of Zhou Muqiao, who not only integrated Western portrait, sketch and water colour techniques with Chinese ink-wash paintings, but was well-versed in painting stage sets, and had great insight in the inner worlds of the figures he was painting. The result was Calendar Posters with beautiful backdrops and highly realistic figures whose emotions leap out of the page. He was the reason why Hwa Ching’s Beauty Cigarettes became one of the best-known brands in China at the time. 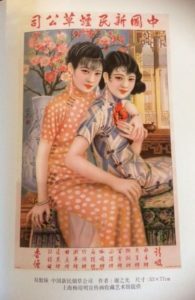 With the economic development and impact of social changes in the 1920s and 30s, the fashionable image of the innocent young female student was transforming into the mature urban woman in a Cheongsam. The artist that captured this image was in Yue Fen Pai, was Hang Zhiying (Shanghai Commercial Press), a highly skilled and innovative artist who studied young women, film stars in the city, and images of women in magazines. After setting up his own studios, the image of the New Woman, tall and slender in a Cheongsam, surrounded by exotic decorative objects, became the hallmark of Zhiying Studios, whose clients included Two Sisters Cologne, Yashuang Facial Cream, White Cat floral prints and Apricot Pavilion moon cakes. Other notable creators of Yuen Fen Pai include Jin Xuecheng and Li Mubai, who became an artistic trio with Hang at his studios, Hu Boxiang who captured the personalities of his figures, and Xu Yongqing who advocated the use of art in commerce and trained up many budding artists. Although Calendar Posters lost their calendar function early in their development, they had retained their original name. This name is a good reminder that all this beauty, innovation and enterprise grew out of the need for diversity of content. The commercial nature of Calendar Poster art gave it a flexibility that made it suitable for being adapted into propaganda art for the Resistance during the Occupation. Its bright colours and wide appeal was borrowed again to reflect the optimism after the founding of New China, adding bold postures and striking poses of Revolution. Even today, original Yue Fen Pai are not only sought after globally, but replicated in ranges of vintage merchandise. Replica prints adorn venues, homes and media around the world, whether it’s a Lisa See novel, or the chic Chinese herbalist shop in London’s famous Camden Town. 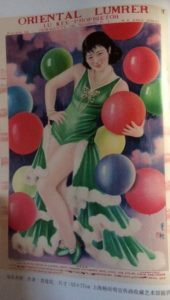 Many TCM products in China have kept their old branding, and the images of calendar girls still appear on tins of throat soothers sold at Seven Eleven. As late as the 1980s, Chinese film posters were still hand drawn, and on these bright and striking movie posters you can still find more than traces of Yue Fen Pai art.